Bounce with your favorite Super Heroes! Looking for a Justice League jumper in San Diego? Look no further! 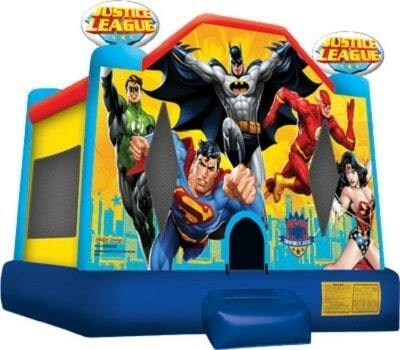 Bounce with Batman, Superman,The Green Lantern, Wonder Woman, and The Flash in this officially licensed Justice League Super Heroes bounce house! This awesome bounce house includes a pair of three-dimensional "Justice League" logos, letting visitors know the location of your fun-filled super hero party!